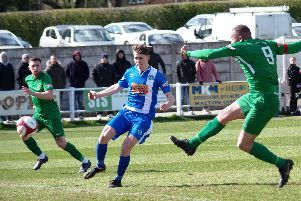 Brighouse Town notched their fifth away win of the season in the NPL’s first division north yesterday when they won 2-1 at Ossett Albion. They were boosted by a 10th-minute goal from Danny Facey, who shook off the attentions of defenders before firing home from 12 yards. Ossett, who were seventh before the start of play but have lost form recently, drew level through Adam Muller on 34 minutes. However, Leon Henry struck the winner midway through the second half, having come on as a substitute not long before. The striker cashed in on great work by Tom Haigh, who laid the ball off to him. Town were making it two wins in six days, having won 4-2 at home to Kendal Town on Saturday. They rose a place to 12th. After a run of five defeats recently, they now have prospects of stringing a winning run together. On Saturday they travel to rock bottom New Mills, who lost 3-0 at Kendal yesterday and have only picked up one point all season. Then on Easter Monday Paul Quinn’s side have a home rematch with Ossett Albion.